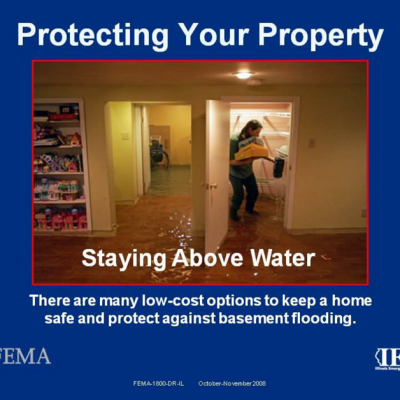 There are a range of possible causes for basement flooding and some potential remedies. Many of these low-cost options can be factored into a family’s budget and accomplished over the several months that precede storm season. Through the drainage system, known as the sump. Backing up through the sewer lines under the house. Seeping through cracks in the walls and floor. Through windows and doors, called overland flooding. Gutters can play a huge role in keeping basements dry and foundations stable. 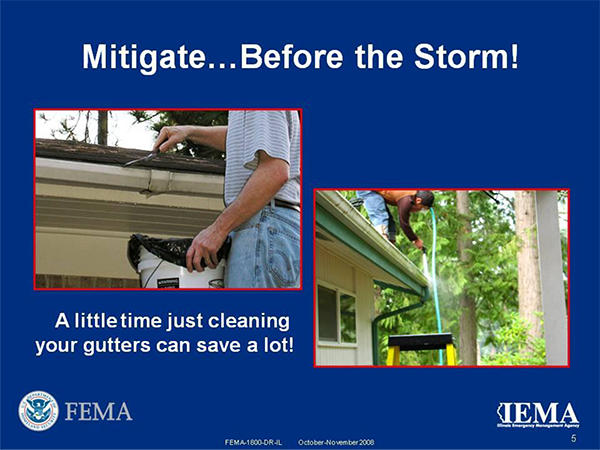 Water damage caused by clogged gutters can be severe. Install gutters and downspouts. Repair them as the need arises. Keep them free of debris. 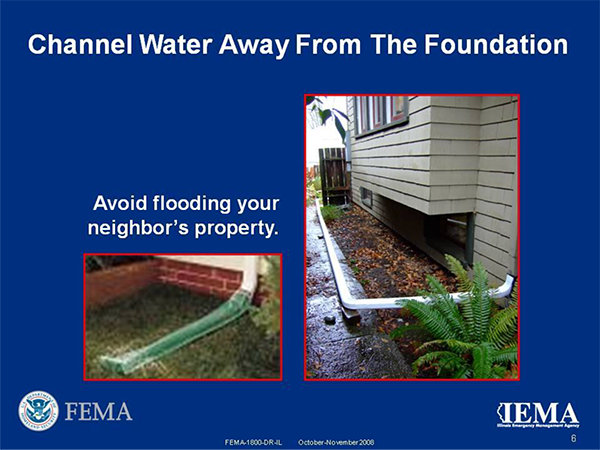 Channel and disperse water away from the home by lengthening the run of downspouts with rigid or flexible extensions. Prevent interior intrusion through windows and replace weather stripping as needed. Many varieties of sturdy window well covers are available, simple to install and hinged for easy access. 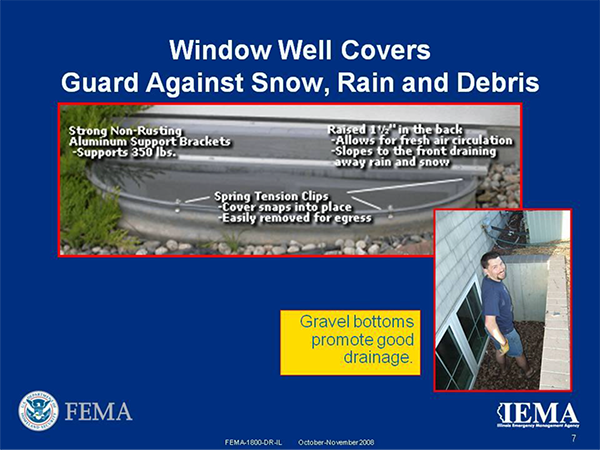 Wells should be constructed with gravel bottoms to promote drainage. Remove organic growth to permit sunlight and ventilation. 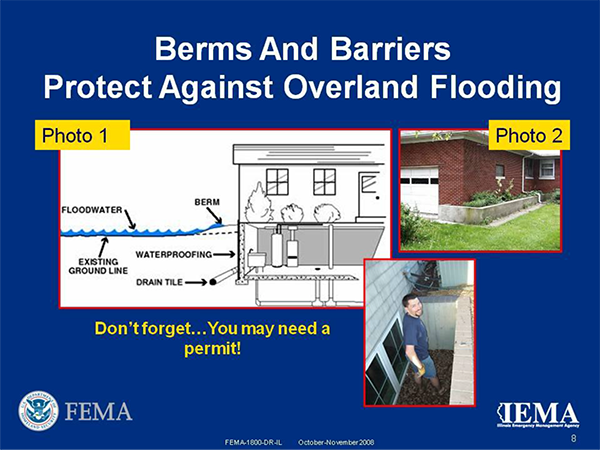 Berms and barriers can help water slope away from the home. The berm’s slope should be about 1 inch per foot and extend for at least 10 feet. It is important to note permits are required any time a homeowner alters the elevation of the property. If berming the soil is not possible, construct a barrier (Photo 2) to keep surface water away from your home’s foundation. The exterior basement walls can be treated with a moisture barrier material. 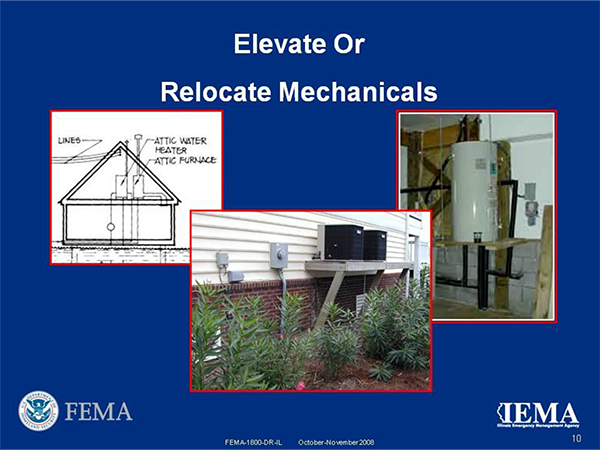 A basement’s circuitry can be elevated above the flood risk. 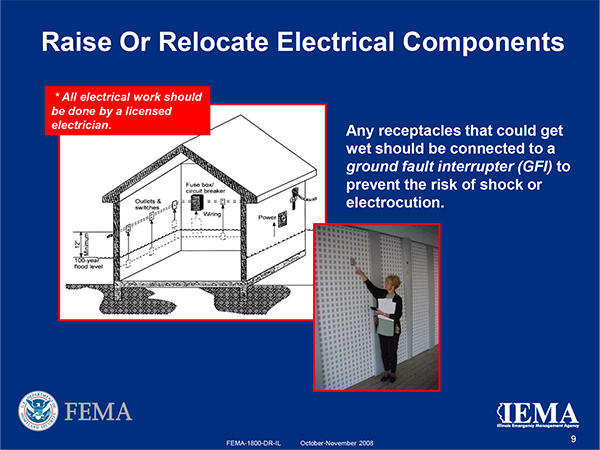 Consider elevating the main electric panel, all outlets, switches, wiring and electric baseboard heating at least one foot above the projected flood elevation. Mark the breaker box for the circuits that feed the basement and shut off the power before entering a flooded basement. Consider raising or relocating your air conditioner, furnace or hot water heater in order to avoid water damage. Don’t dismiss the attic as an area for utilities. Have a qualified technician inspect mechanical systems exposed to water. When elevating is not an option, a barrier wall can provide protection from encroaching water and debris. 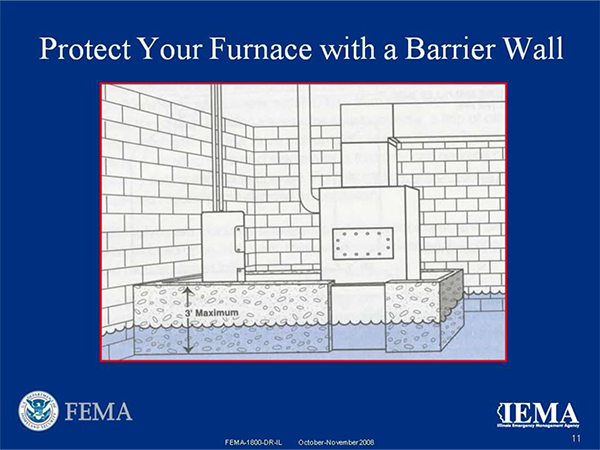 Consider building a concrete or masonry floodwall around the furnace or water heater. The wall may not be water tight, but it could save your equipment from serious damage. Consider installing a tankless water heater. 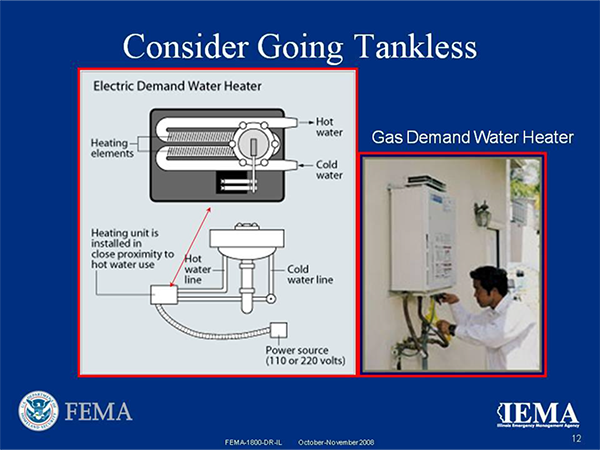 Tankless models do not store hot water, do not have a tank and can be elevated above the flood risk. Consumers have a choice between whole house systems or individual units mounted at each water source. Users have reported savings of from $40-80 per year with electric systems and $50-100 per year with gas-powered models. Contact Toledo Basement Repair TODAY and we’ll determine which of these issues are causing your basement leaks and offer you a fair estimate for repairs. Our top priority is giving you a dry and healthy for your family! I'm getting water in my basement. There are cracks in my basement walls. My basement walls are bowing. I have a damp crawl space. I am having sump pump problems. Other (please describe).